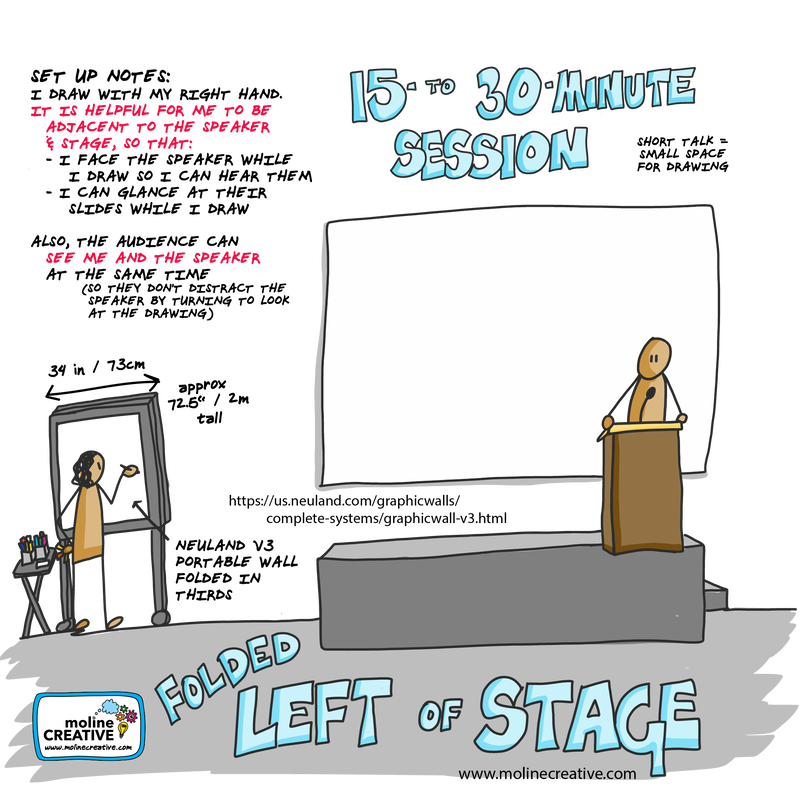 I draw with my right hand, so it is helpful for me to be adjacent to the speaker and stage. I prefer to be on the left side (as shown). I like to face the speaker while I draw so I can hear what they have to say and glance at their slides while I draw. 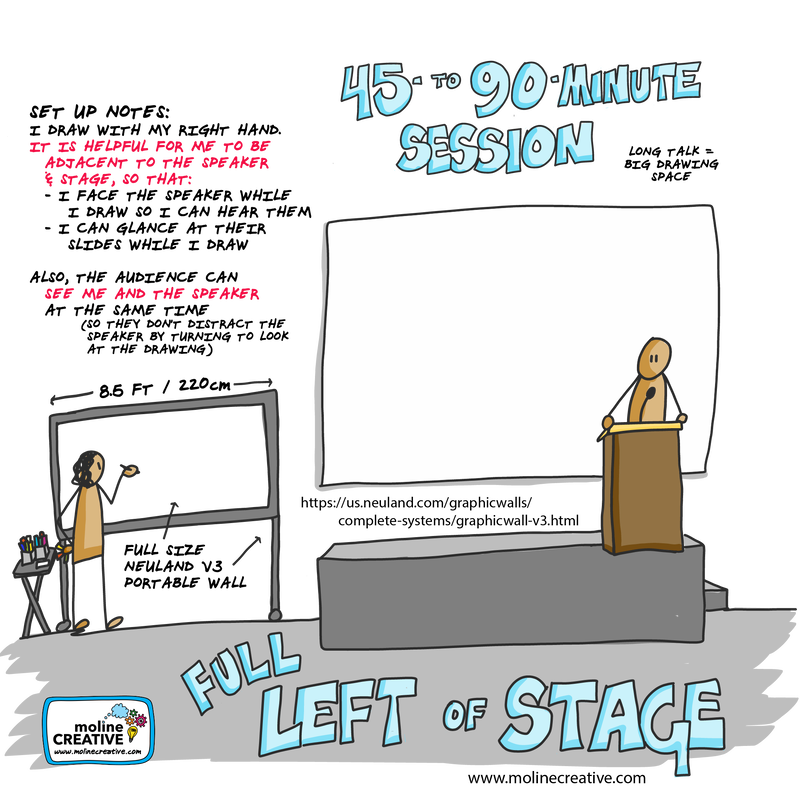 It is helpful when the audience can see the speaker, speaker's slides (if any) and my visual notes, so they aren't turning to look at the notes (which could distract the speaker). I like to have a little table (or tray on a stand) at the side of my drawing wall in order to organize and access my supplies. Full size drawings: I fill approximately a 4 ft x 8 ft sheet of paper per hour when I am working full size. I typically bring my Neuland V3 board when traveling to local events in my personal vehicle, but the V3 is too big to fly. I am happy to draw on a whiteboard, scientific poster display board, or foam board on easels when working full size. If I need to draw more than 8 feet of presentations, I can set up sheets of foam board on easels. 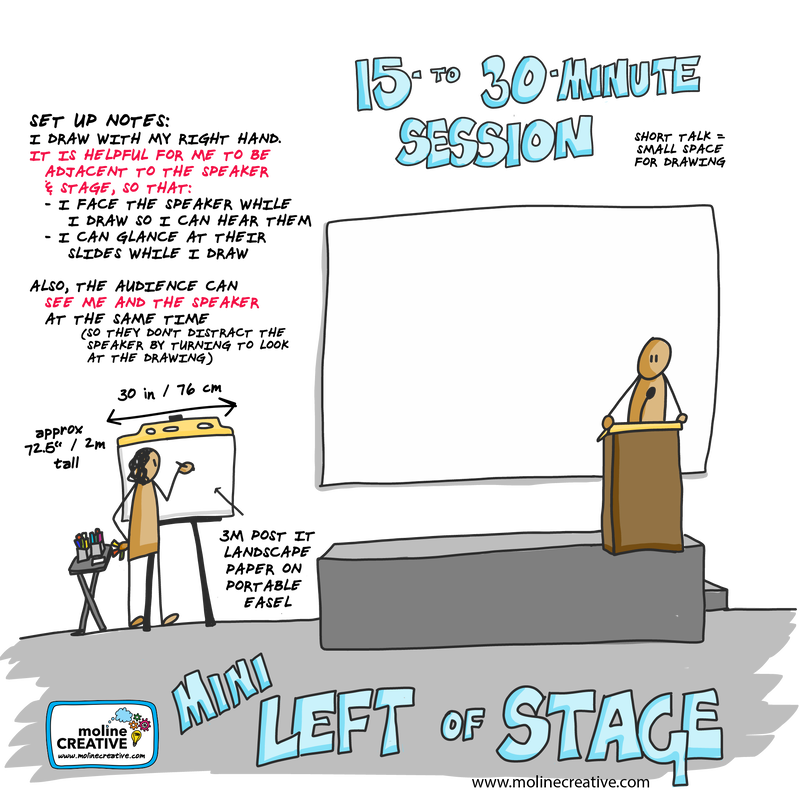 Smaller size drawings: Shorter talks (less than 30 minutes or so) should probably be drawn on slightly smaller paper. I can fold my Neuland V3 board into thirds to draw on a smaller space (paper 30" x 48"). See the folded setup below. Alternately, I can use 3M Post It Landscape Flip Chart or regular (non-sticky) paper on an easel. See the mini set up below. Yet another option is for me to draw in a sketchbook on my lap. Typical sketchbook sizes are: 6 x 8 inches, 8 x 11 inches, 11 x 14 inches. Visual notes from 15-min talks at the US-IALE conference on display in the lobby. Small notes are torn from an 11 x 16 in sketchbook and large notes are on 24 x 30 in post it flip chart pages (landscape). Drawing on a 4ft x 6 ft portable whiteboard to the left of a speaker. 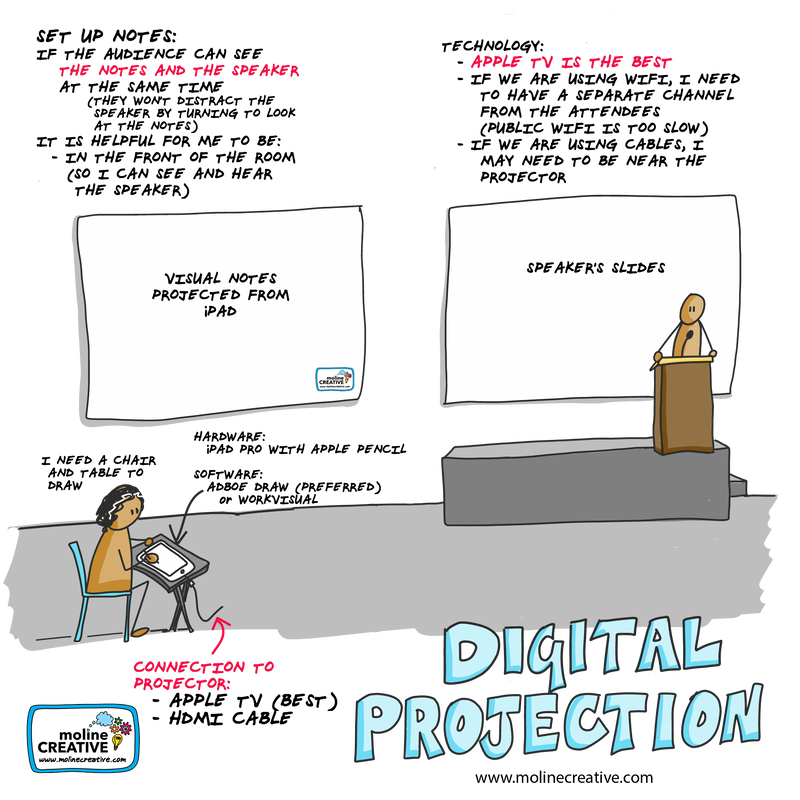 The speaker's slides were projected at the far right and left of the room. The small accessory table at the left of the drawing board is my own. This image shows me drawing visual notes on the Neuland V3 folded into thirds. drawing on the IPAD : project the images almost any size - and i can work remotely! I need to be able to see and hear the speaker and glance at their slides, so it is helpful to be at the front of the room. I do not actually have to be in the room! I work from the speaker's words (mostly) and slides (a little bit), so if I have a good audio / video connection with the speaker and a fast internet connection to the meeting room, I can draw from my studio in Flagstaff! I use an Apple iPad Pro and Apple Pencil for live, digital drawings.